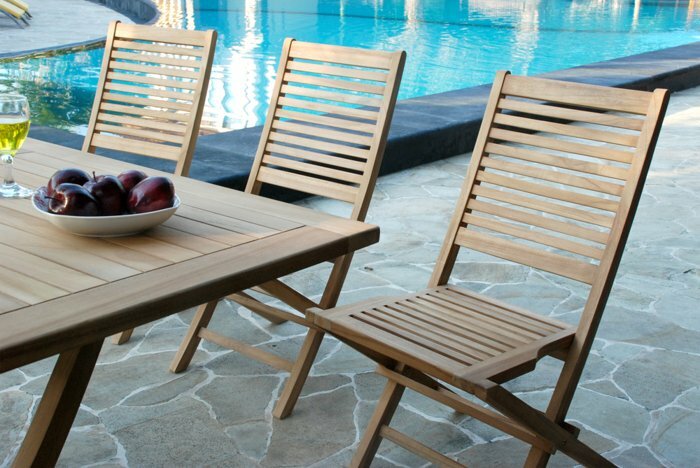 What are distinctive teak wood properties? Once of the sure tell-tale signs when identifying teak wood furniture is by looking at the colour of the piece of furniture. The colour of teak furniture can vary significantly depending on which grade the wood is marked as, from Grade A to C. As a general rule, higher quality is dark golden-brown in colour, which fades as the quality declines to a yellowish-white colour. 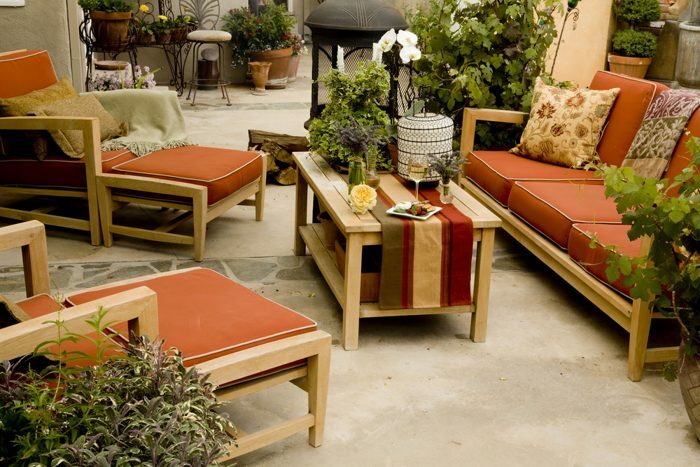 How to identify the different types of teak? Grade A teak: A warm honey colour, close-grained and oily to touch. Often contains straight grain lines. Grade B teak: Normally a lighter, duller colour with greater variation. An uneven grain with slightly less shine once sanded. Grade C teak: The variation in colour is quite distinct, as it can be very patchy, with a high contrast in colour. It is easy to be damaged due to the low oil content. When trying to figure out whether a piece of furniture is real or fake teak wood, you should be aware of the staining carried out by companies to trick customers into thinking they’re buying the top, Grade A teak. This is done by using staining chemicals, such as sulphuric acid or hydrogen peroxide, which can be dangerous if inhaled during sanding or average wear and tear. This staining severely damages the teak furniture by drying out the natural oils found in real teak, causing brittleness and the weakening of the timber to the same properties as softwood. Therefore, as customers, it is important to be vigilant. Just because a teak wood furniture looks dark in colour, similar to Garde A teak, it may not necessarily mean that it is good quality. 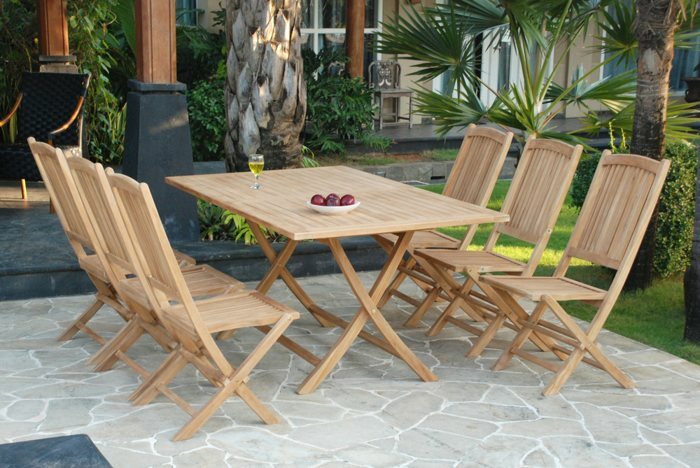 Perhaps, the best way to go identifying high quality teak in such cases is to simply ask the furniture company for the age of the teak furniture, as real teak naturally gets darker with age. This way you can make sure you get the type of wood you want and find out whether staining has been used to recreate a dark wood colour. This is one of our own Grenada chairs and next to it is a cheap copy from one of our competitors, which has been stained. After looking at the teak wood colour, the next most easily identifiable teak wood property is its grain pattern. 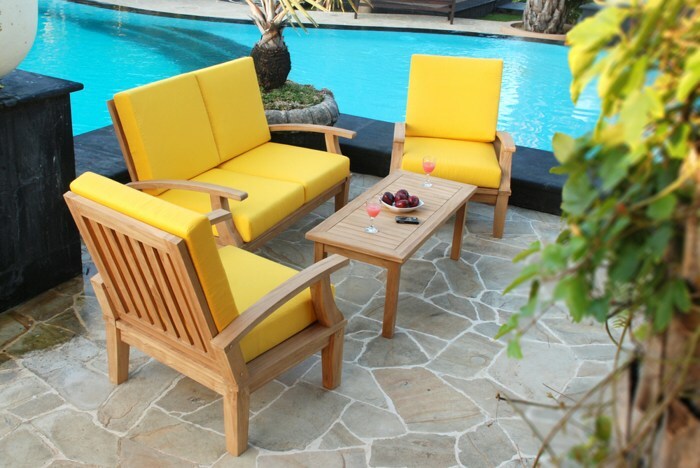 If you suspect the teak has been chemically treated, look out for individual pieces that do not contain any grain. 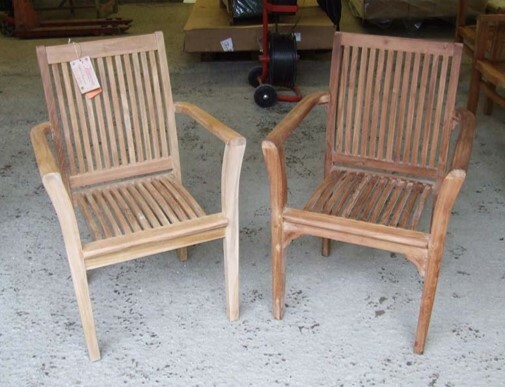 This is a method several UK retailers use to fool the customer into thinking they are buying Grade A teak, so it is important to keep your wits about you when purchasing, to avoid being conned. The grain pattern of teak wood is more often than not straight, but depending on how the wood was cut, it can also have wavy grain lines in some cases. Although, in some instances, it can be entirely natural – for example, Burmese Grade A teak will contain mostly straight grain, whereas Indonesian Planation Grade A teak may contain more of a unique curvy grain. Smell is a great indicator when you are wondering how to identify teak wood furniture. As you are aware, real teak wood often has a high natural oil content – it is this that helps it to resist pests and prevents the risk of decay, such as splitting or discolouring. As a result, when reviewing the piece of furniture, you should be able to use your senses to detect one of the most distinct properties of teak wood: the smell. It is well-known that the natural oils found in real teak create an interesting aroma that is likened to the smell of leather. In addition, as well as the appearance and fragrance, another way to identify real teak wood is the weight. If the piece is genuine – whether it be Grade A, B or C – the weight will give the game away immediately. In wood density, teak wood is usually around the 0.65 mark, meaning that it is considered “moderately heavy”. Therefore, a simple test to find out whether the wooden piece is teak is to check whether it is heavy and sturdy enough. If the piece of furniture seems suspicious and too light, it may have been created using particle boards and teak veneered MDF – often disguised and sold as “solid teak wood” – and should set alarm bells ringing as they are significantly lighter in weight.